I’m terrified of butterflies. No, really. When I was young, maybe 10, I saw the James Bond movie A View to a Kill. Yes, way too young for that movie, I know. Anyway, there are poison dart butterflies in it, and ever since then, butterflies give me the heebies and the jeebies. I’m trying to get over it. Our zoo, like many other zoos, has one of those horribly creepy walk-through butterfly exhibits every summer, where the butterflies may land on you, and you’re supposed to not scream and swat them into oblivion or dance around like your toes are on fire. And my daughter loves it. I’ve had her in a stroller when we’ve gone through it before, so I have walked behind her, shivering and having little silent freakouts, and she’s been none the wiser. But she’s starting to outgrow the stroller, and one of these days, she’ll walk through on her own, and I’d like to have my pathetic little phobia under control so I can at least pretend that I’m not dying and screaming on the inside. 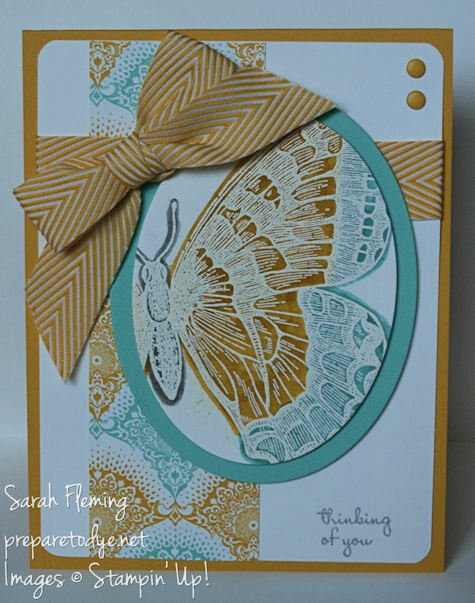 The butterfly is embossed in white embossing powder, then colored in with Coastal Cabana and Crushed Curry markers, plus some Smoky Slate around the disgusting insect body of the butterfly. This is why they’re creepy, by the way — they’re insects pretending to be birds. They’re hiding something. Anyway, I have to admit they’re pretty. Even if they’re sneaky little bugs. You can find all of these products in my Stampin’ Up! store, 24/7!